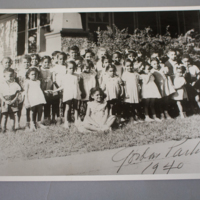 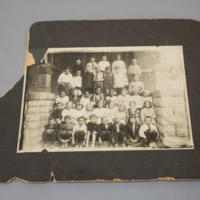 Photo of grade school class at Gordon Parks School. 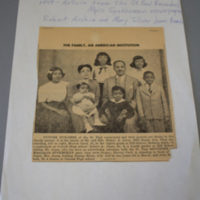 Newspaper clipping, "The Family, an American Institution"
Photograph of school children featuring the contributor's mother, Mary Toliver Jones. 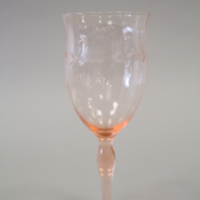 Distressed pink glass water goblet owned by Robert Archie and Mary Alice Toliver Jones. 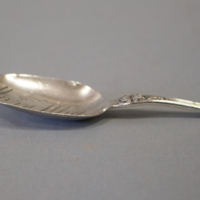 Sterling silver baby spoon engraved with the contributors' mother's name: Mary Alice. 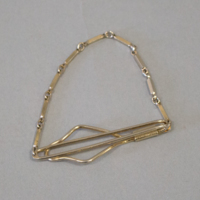 Tie clip owned by the contributors' father: Robert Archie Jones. 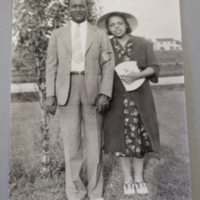 Remembering Rondo | History Harvest by Rondo Avenue, Inc. and Macalester College is licensed under a Creative Commons Attribution-NonCommercial-ShareAlike 4.0 International License.